I love parfaits. They are such pretty things to make, with all kinds of possibilities from what ingredients you are going to layer to what glasses you will serve them in. For these, I used our small stemless champagne flutes. I thought they made a perfect parfait, because they are just 4 ounce glasses and so the desserts were not huge, they were just right. This parfait is made up of two creamy puddings - one chocolate, one peanut butter. It's topped off with whipped cream. You can make the puddings early in the day and refrigerate them and then assemble the parfaits later. Or you can even make the parfaits a day ahead. 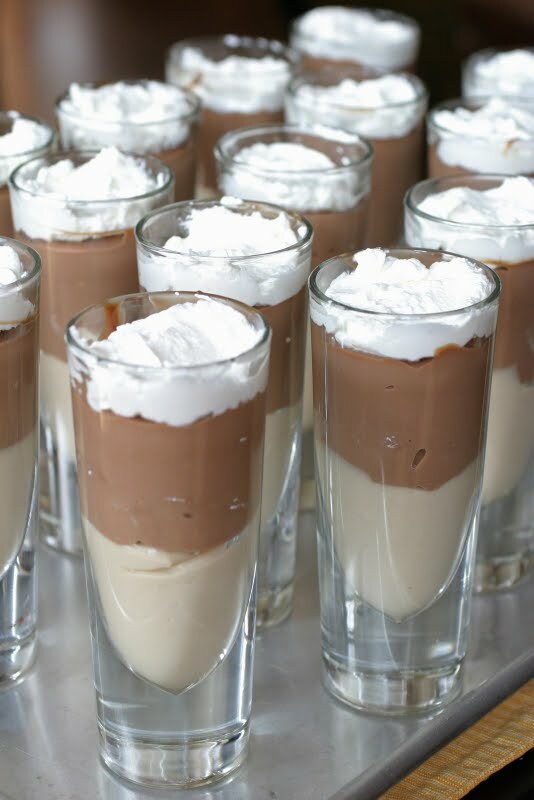 When I made these, I doubled the recipe for the chocolate pudding because I was making twelve parfaits and I wanted the pudding to come up almost to the top of the glasses. Whisk first 3 ingredients in large saucepan to blend. Gradually whisk in milk, then cream. Whisk over medium heat until mixture comes to a boil. Then boil until thick, whisking constantly, about 30 seconds. Whisk in peanut butter; boil unti thick again, whisking often, about 1 minute longer. Remove from heat; whisk in vanilla. Divide pudding among six 1-cup glasses or twelve 4 ounce glasses. Chill uncovered while preparing chocolate pudding. Whisk first 4 ingredients in heavy large saucepan. Gradually whisk in milk, then cream. Whisk over medium heat until mixture comes to boil. Boil until thick, whisking constantly, about 30 seconds. Add chopped chocolate. Boil until chocolate melts and pudding is thick again, whisking often, 1 to 2 minutes longer. Remove from heat; whisk in vanilla. Cool pudding 5 minutes. Spoon atop peanut butter pudding, dividing equally. Chill puddings uncovered until cold, at least 2 hours. Can be made 1 day ahead. Cover and keep chilled. This is something my husband would just LOVE. I might have to treat him. The glasses look great for this. yum.... these are so beautiful and delicious! I see 16 there, who were the lucky ones to have these? Why can't you live closer? oh man, those look so so good! How have I lived without peanut butter pudding? These looks great. Can't go wrong with that flavor combination! Both of those puddings sound amazing. And I just love how you served them! Love a parfait, and what could be better than chocolate and peanut butter...not much, maybe peanut butter and nutella! I made this at Easter and everyone loved it. Thanks!! May 4, 2009 | Chanit H.
You have a wonderful site and will be a frequent visitor. I came across this dessert on your site searching for panacotta and this one inspired me to try out parfait for the first time. My daughter is not supposed to have peanuts so I substituted it with nutella. Thanks for such a wonderful recipe. Can't wait for the rave reviews!! These look delicious. I want to make this and I also want to find these stemless champagne flutes! Can you tell me where to purchase them?